Please note that a Next Day shipping service is not available for this item. This coin is in new brilliant, uncirculated mint condition and is first layered in pure bright silver. Then, by hand, the figure is highlighted and brought to life with rich, pure 24K gold. This breathtaking work, done exclusively by J & J Jewelers, turns the obverse of each gleaming commemorative coin into a stunning and true work of art. Each coin is hermetically sealed against wear in clear, hard acrylic coating. The coin comes with an 18" chain and in a jewelry box. 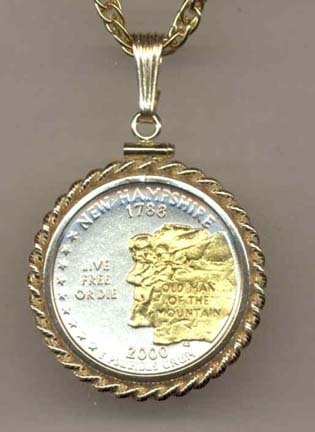 You have your choice of a beautiful sterling silver or a gold filled (as shown) rope type bezel frame around the coin. Please Note: The gold and silver is much brighter and distinct than what the photograph shows. 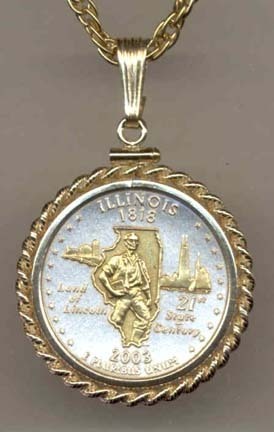 You found Illinois Two Tone Rope Bezel Statehood Quarter with 18" Rope Necklace in category Teamware / Logo and subcategory Jewelry & Watches. If you need to buy more Jewelry & Watches than you are on the righ place. Please note that a Next Day shipping service is not available for this item. Real minted coin cut out. This coin is the size of a U.S. quarter. 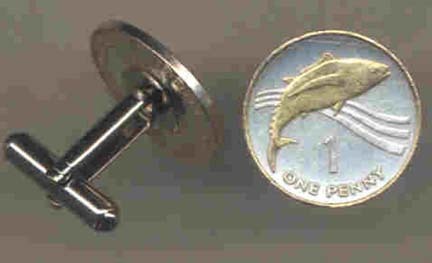 First, a small hole is drilled into the coin, then a very fine jeweler's saw blade is inserted through the hole and worked around the coin's design, cutting away the background, thus leaving the coin's figure floating inside its outer edge. The figure is then selectively layered in brilliant gold and silver. All of this work is done by hand.Each work of art comes in a jewelry box on a copper rope chain layered in 14KT gold. Please note that a Next Day shipping service is not available for this item. This real coin, which is a little smaller than a U.S. nickel, is first layered in pure bright silver. Then, by hand, the figure is highlighted and brought to life with rich, pure 24K gold. This breathtaking work, done exclusively by J & J Jewelers, turns the coin into a stunning and true work of art. Each coin is hermetically sealed against wear in clear, hard acrylic coating. The coins are then made into a unique pair of cuff links and placed in a jewelry box. Please Note: The gold and silver is much brighter and distinct than what the photograph shows. Please note that a Next Day shipping service is not available for this item. This real coin is first layered in pure bright silver. Then, by hand, the figure is highlighted and brought to life with rich, pure 24K gold. This breathtaking and exclusive work turns the coin into a stunning and true work of art. Each coin is hermetically sealed against wear in clear, hard acrylic coating. 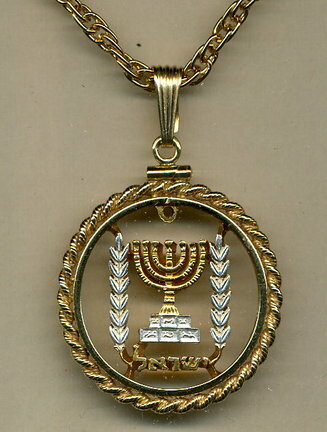 The coin comes on a copper rope chain layered in 14K gold and placed in a jewelry box. 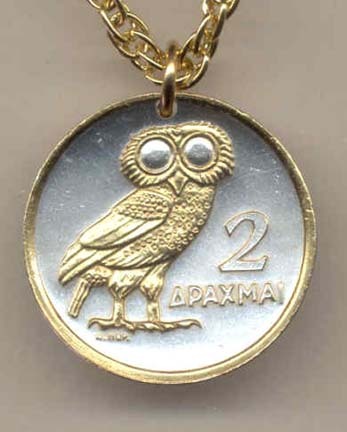 The coin is a same size as a quarter.Please Note: The gold and silver is much brighter and distinct than what the photograph shows.